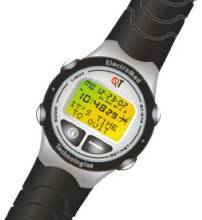 Including an alarm, stopwatch, and backlight. Quality you’ll feel as soon as you slip it on. Only you will know you are trying to quit. How much money you’ve saved. Includes alarms designed to remind you about your patches and/or pills. The cigarette meter helps increase the amount of time between cigarettes and is especially designed to defeat chain smoking. Provides positive feedback customized to your needs and stage in the quitting process. Just press the cigarette button each time you light up. The handy clip doubles as a desk stand, so you’ll never be without your QT-Watch!